There is a pretty good chance that I experienced Disneyland's classic attraction America Sings...sad thing is, I don't remember it at all. I'm pretty sure I would appreciate this attraction on a deeply visceral level, the same way I do the Country Bear Jamboree and Enchanted Tiki Room. Though not the last "great" attraction to be built, it is the last attraction in this style. Over 100 anamatronic animals tell the story of American musical styles in a rotating theater. (ala Carousel of Progress.) Hosted by an eagle named Sam (voiced by the incomparable Burl Ives) and his sidekick Ollie the owl. The show traverses time, location, and musical genre. Take some time out of your busy Monday to enjoy this super charming show. The show lasted in Disneyland's Tomorrowland a full 14 years before closing, but never caught on the same way the Tiki Birds did. (or the Country Bears, for that matter) There is a cult of people however, that still look back at the show fondly...and it even gets a quick nod during the Remember, Dreams Come True fireworks. The soundtrack to America Sings is occasionally available on eBay...though it hasn't been released on iTunes yet. Get with it Disney, this is a money maker. When I was a teen in the 70's, I road-tripped to DL with my best friend who'd never been to the park. For the bulk of the first day, he didn't "get" Disneyland...until we hit American Sings (and the Country Bears). From that moment on, he was a fan. 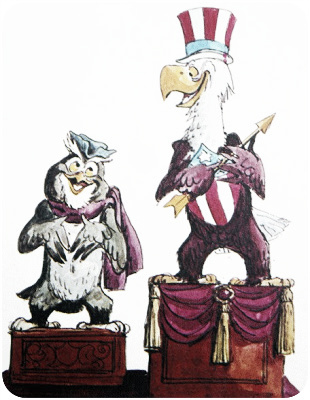 I'd never been a huge fan of America Sings up to that point (I really missed Carousel of Progress), but after many viewings I became very fond of the show. The humor had its ups and downs: The Old Gray Mare was my pick for Most Awful Thing in Disneyland, but Saddle Sore Swanson and the weary cop holding the drunk goose made everyone laugh the moment the spotlight hit them. Great music selection, overall. Of the four "rock" songs chosen for the show, three have remained well-remembered classics of the era. One problem that plagued the show was the sound-bleed between theater sections. Most of the time it wasn't noticeable, but they unwisely chose "Home on the Range" to close out the western section, and the beautiful ballad was kind of ruined by very loud "Down By The Riverside" being plainly audible through the walls from the previous stage.